Last week, I got an email from 23andMe announcing that they had “genotyped more than one million people worldwide,” and that I was number 85,552. Big news for a company that has weathered a lot of ups and downs, particularly in November 2013 when the FDA demanded that they stop providing health information. As number 85,552, I had signed up prior to the health information shut down, so I was privy to my health information. Luckily, as it turns out, my health information didn’t contain any earth shattering news. My ancestry results however were a big surprise. Even with my unexpected genealogy results, my 23andMe results didn’t have a big impact on me personally. However, professionally, as a health care communicator, I believe that the fact one million consumers are willing to be genotyped is a big deal. As their press release states, “Today, 23andMe has the world’s largest database of re-contactable individuals who have consented to participate in [genetic] research.” Talk about empowered consumers. And 23andMe is just one of the many emerging services and products aimed at putting more health information into the hands of consumers. Consider the Scanadu Scout, a device that sends blood pressure, heart rate, temperature, and blood oxygen levels to a consumer’s iPhone. • The ability to explain complex health information in simple ways is even more critical than ever before. Having a commitment to health literacy built into a company’s DNA will be the cost of doing business in our data rich world. 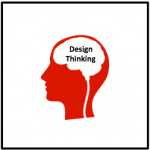 • Factoring in the consumer’s emotional increases in importance. Understanding the impact health information can have on a person’s emotional state can be the difference between effectively communicating and sending a consumer into a downward spiral of fear and confusion. • Helping consumers turn knowledge into action is vital. Providing concrete next steps to help consumers act upon what they have learned turns reams of data into potentially lifesaving information. As health care communicators, our ability to help consumers process the avalanche of health care information coming their way can make a real difference in people’s lives. For a robust understanding of what is coming down the pike, read Eric Topol’s latest book, “The Patient Will See You Now.” The book is a veritable canon on the trends in personalized medicine. As 23andMe’s #Powerof1Million announcement makes clear, the future is closer than we think. 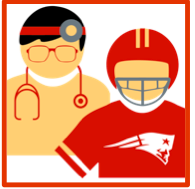 Tom Brady and Atul Gawande, two Bostonians with wildly divergent careers, both take the same approach to designing a different end game; they flout the conventional wisdom to achieve their objectives. For marketers wanting to change the trajectory of their brand, company, industry or career, these two prominent Bostonians show the power of doing things differently. Tom Brady, the New England Patriots quarterback, has always been vocal about wanting a different end game, one that would keep him playing high-level football in his 40’s. So according to a recent New York Times Magazine article, Tom defies conventional training practices designed at building strength in favor of those that create more pliable muscles. He credits his unique training practice with sparing him from career ending injuries, ultimately enabling him to win 4 Super Bowls (so far). Atul Gawande, Boston surgeon and best selling author, challenges the more medicine is better medicine dogma that runs deep in our American cultural veins. Gawande addresses the literal “end game” in his best-selling book Being Mortal, to propose a radical new approach on appropriate care in our last years. Rather than doing everything possible to ensure maximum patient safety and longevity, Gawande contends that instead, a doctor’s role is to ensure that people leave this earth in a way that respects their values and priorities. To do this, physicians and family members need to understand what constitutes quality of life from the patient’s point of view. In one example, Gawande tells of a daughter’s surprise at her father’s definition of quality of life as “being able to eat chocolate ice cream and watch football.” Her father had been a professor emeritus so she assumed he would not have wanted to live unless it was as a fully functioning intellectual. It was this knowledge that helped her make an entirely different choice for her father when faced with a life and death decision by her father’s surgeons. I wasn’t so lucky with my father. The idea that more medicine, more effort, is not always appropriate was a totally foreign concept to me for most of his illness (and most of my life). So the poor guy cycled in and out of the hospital to rehab a number of times, getting weaker with every visit. By the time a palliative nurse friend of mine, helped me to see the light, it was too late. Having made the decision to bring him home after our post-dinner talk, I received a call the next morning that he had died in the Rehab institution. While I can take comfort that my father seemed to enjoy all the attention he received at the Rehab facility, I often wonder if he would preferred a different ending. With my 88-year old mother, I have an opportunity not to make the same mistake. The lessons of Gawande’s Being Mortal and Tom Brady’s historic Super Bowl victory transcend their individual career choices. Their work is testament to the truth of Einstein’s definition of insanity–doing something over and over again and expecting a different result. These two different men offer the same valuable lesson about the need to challenge the status quo to achieve a different result. I know a lot of talented and progressive marketers who are confronting these doctrines on a daily basis. It’s hard work to be the one constantly going against the grain. But the experiences of Tom Brady and Atul Gawande are proof that a successful end game is worth the fight. And once in the game, patient marketers should make development of customer service and adherence programs the first order of business. As payers and patients have to increasingly make cost/quality trade-offs, it is critical that marketers can prove that their patient services actually make a difference in adherence rates, patient experience and clinical outcomes. In fact, patient services already a factor into 3rd party purchase decisions. For example, according to a Duke physician I heard speak at a conference, Eliquis, a medication in the very crowded stroke prevention category, was chosen over competitors because the brand had the strongest co-pay assistance program. And this one organization needs to be reoriented towards driving patient satisfaction rather than driving sales. Driving satisfaction doesn’t mean revenue generation takes a back seat. There is a whole body of literature that proves that higher customer satisfaction scores result in higher sales and profits, in industry after industry. Seems everybody’s talking orphan drugs these days. No wonder, according to EvaluatePharma’s 2013 Orphan Drug Report, orphan drugs are estimated to reach 15.9% of total worldwide prescription sales by 2018. But the orphan drug impact goes beyond sales numbers. 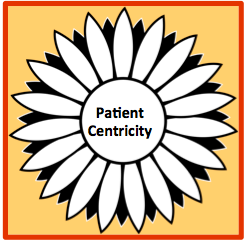 I believe that the patient centricity blossoming in the rare disease divisions will eventually spill over into the primary care divisions of pharmaceutical companies. With the big blockbuster primary care drugs, development success lay primarily with company research departments. The halls of Pharma echo with stories of researcher heroics—how the lone scientist kept a molecule from hitting the drug dustbin only to become the next blockbuster. But in orphan drugs, the heroes are as likely to be individual patient family members as researchers. In some cases the drug literally starts with patient families. Thanks to advances in digital technology and social media, orphan drug patient families play a major role in every aspect of bringing a drug to market, going far beyond traditional advocacy roles. Now individuals are able to leap tall barriers with a click of a mouse to accomplish superhero feats formerly reserved for massive organizations like the NIH and pharmaceutical companies. Disease discovery: Matt Might, a father whose son had a disease entirely unknown to science, leapt over barriers of scientific self-interest to find other patients and give his son’s illness a name. Research direction: John Crowley funded individual scientists to fill the treatment void when he learned his daughter had Pompe disease. Ultimately John ended up partnering with one scientist to form a company that eventually was folded into Genzyme. And while his story is certainly one of the most dramatic (to the point of being the subject of a major motion picture starring Harrison Ford), John’s ability to drive the course of scientific discovery is becoming more commonplace in the rare disease space. Product approval parameters: In June 2014, the Parent Project Muscular Dystrophy (PPMD) patient group, submitted the first ever-patient advocacy-initiated draft guidance for a rare disease to the FDA for Duchenne muscular dystrophy. Patients, through organizations like the PPMD, are now directly driving how Pharma should be conducting their research. Because of the outsized role patients and their families play in bringing a drug to market, building strong patient relationships is a key marketing investment for orphan drug marketers. For example, Biogen Idec, deployed over 15 community managers to support people with living with hemophilia even before they had an approved product. 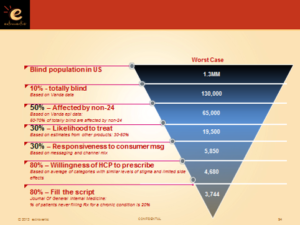 There are already signs of an “orphan drug spillover effect” on primary care marketing. Consider Sanofi’s community manager position in their Diabetes franchise. Or more recently, that Sanofi appointed a Chief Patient Officer. And this I believe, is just the start of the orphan drug effect. Soon the patient centric tactics of Rare Disease marketers will be highlighted in “marketing excellence” meetings all over Pharma. Then questions will come during marketing plan presentations about “why can’t primary care teams start building patient relationships like their rare disease counter parts?” And before you know it, the small seeds of patient centricity will finally blossom throughout Pharma. Patient Shopping in Our Lifetime? This was the one of the final questions asked at a recent Elsevier conference where I was a speaker. The panel charged with answering this question was largely pessimistic. Panelists felt that the byzantine system of setting prices for both medical procedures and pharmaceuticals made it unlikely that consumers would ever get the cost data required for effective shopping behavior. They couldn’t imagine that anyone in the industry would step up to the challenge of making prices more transparent. There is certainly reason for their negative outlook. For example, a recent study by Verilogue and Duke Medical Center found that when oncologists discussed breast cancer treatment options with patients, costs were only discussed in 20% of the cases. If patients can’t get information on the costs and outcomes of various medical and drug treatments, then they can’t make the appropriate trade-offs. In my opinion, the Elsevier panel was right and wrong. Right because strides towards increased pricing transparency won’t come from within the industry. But wrong because change will be instigated from outside the industry—by government, non-profit organizations and entrepreneurs unencumbered by the war wounds of fighting vested health care interests. On the non-profit side, there is the Minnesota Community Measure Up coalition. They created the Minnesota D5 program, which provides effectiveness scores for treating diabetes by individual clinics/HCP offices. 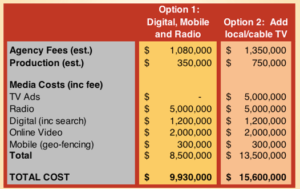 Newer health care services like Counsyl, a genetic testing company, have actually built cost transparency into their business model. Counsyl has developed a proprietary tool that allows patients to calculate their exact costs once their particular insurance policy is factored in before they sign up for the service. Iodine, a newcomer in the cost and rating business for drugs, has developed a very easy interface to help consumers start evaluating the cost/quality trade-offs for different medications. Information will drive true shopper behavior. Contrary to popular belief, patients can make educated choices. Patients don’t reflexively opt for latest and the greatest medical solution. As reported in the New York Times, a recent study in the Annals of Surgery, found that parents actually made the cost effective choice regarding appendectomies for their children. When parents were told that both conventional and laparoscopic surgery yielded the same results, but that conventional surgery was far less expensive, two-thirds of parents chose the less expensive conventional surgery. 31% said that the information they received was the primary driver in their decision and 90% liked having a choice. Pharma companies are going to have to learn how to market to health care shoppers rather than patients. This means that not only will pharmaceutical companies have to include cost in their outcomes studies with payers, they will also have to convince health care shoppers that their drugs represent a good value for the money. And much like restaurants and hotels, Pharma companies will have to regularly monitor the various patient quality and cost rating systems to make sure their medications are fairly portrayed. A bad rating will have a direct impact on revenues, as consumers fail to start or stop using a medication, based on a rating they saw. Pharma companies will need to include these products ratings from patient sites in their analyses of sales results. I predict that these analyses will show a direct correlation between consumer ratings and revenue. And when that happens, it will be the dawn of the era of the true health care shopper! Pharmaceutical marketers have been talking about Empowered Patients ever since I joined Pfizer Pharmaceuticals in the mid-90’s as one of their first consumer marketing hires. But despite all the talk, most pharmaceutical companies are nowhere near being patient-focused. Pharma marketers know things are changing but are holding onto the HCP-focused status quo for as long as possible. In fact, I was recently asked by a Pharma Exec charged with driving patient engagement, “When do we really have to get serious about patients?” They felt that their primary customer was still the physician. 1. 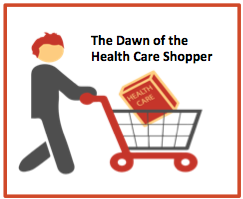 The Dawn of Health Care Shoppers-Historically, consumers exhibited very little true shopping behavior, even as they became increasingly responsible for their health care costs. This lack of true shopping behavior was largely because consumers had little visibility into costs and quality data and therefore couldn’t make the necessary trade-offs. Health care reform, combined with private sector efforts, are increasing transparency around both costs and quality, allowing consumers to start making trade-offs with their health care expenditures, including medications. Patients will move from merely asking a physician for a particular drug they saw advertised on television to making a highly considered decision to pay for drug A or drug B. With this true decision-making, patients will be able to move markets. As this market moving ability starts to show up in pharma company regression analyses, Pharma companies will be stumbling over each other to be the most patient-centric. 2. 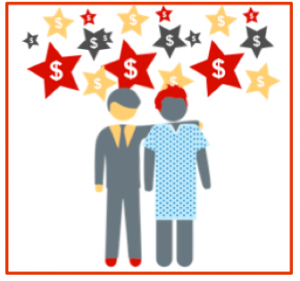 The shifting economics of their customers-HCPs, Hospitals and Integrated Delivery Systems won’t be rewarded on the quantity of services they deliver anymore, but rather on the quality of those services and the patient experience. The smart pharmaceutical companies are going to look for ways to help their customers deliver better patient outcomes and experiences. And that is going to require additional investment to prove their patient interventions actually deliver. 3. The exploding orphan drug opportunity-Specialty and orphan drugs now represent the path to financial growth for many Pharma companies. And along with the orphan drug opportunity comes the empowered patient. These patients play a significant role in which drugs get into clinical trials, get approved by the FDA and reimbursed by insurers. If a company is in the Orphan Drug space, then by default they have to be patient centric. 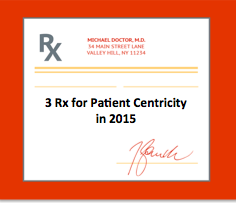 I predict that this “patient centricity” will eventually work its way into larger, primary care marketing practices. 4. Patient Reported Outcomes (PROs) in clinical trials will increasingly become commercial differentiators-In many categories, pharmaceutical researchers have already captured patient-reported outcomes, particularly on quality of life. 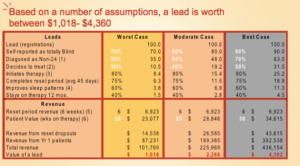 However, these metrics have had little true commercial value since the FDA has been leery of approving claims based on patient reported outcomes. I believe that the FDA’s new focus on patient centricity, as witnessed by their “Patient Focused Drug Development” initiative may signal a growing acceptance of PRO claims. And as PROs become more important to the commercial success of a medication, so will the patients. It is this alignment of Pharma’s financial stars around patient-centricity, that makes me believe that pharmaceutical companies will finally begin to truly embrace the empowered patient. Just follow the money. It never lies.